Blizzards, sub-freezing temperatures, ice and snow -- North Texas can experience all of these types of winter weather. Aside from grabbing your coat, what do you need to do to get ready? Before the cold, replace worn weatherstripping on doors and windows to ensure there is a good seal. This will make sure warm air stays inside and cold air stays outside. Most modern windows are sealed inside the frame, but older windows may be sealed with a glaze that can crack and need replacing. The glaze may need to be applied above a certain temperature and it'll need time to cure -- this maintenance is ideally done in the spring or fall. Lastly check your gutters to make sure they are clear and allow for water to flow freely to the downspout. Blocked gutters can lead to water entering the home. The Texas Department of Insurance also recommends trimming trees away from power lines, homes and cars and checking the insulation level in attics. Most North Texans know to insulate their outdoor faucets, but if the cold snap is prolonged it could be a good idea to also leave inside faucets on external walls dripping overnight so that they don't freeze. The drip, drip, drip from running faucets, if heard, can be annoying, so put a sponge or towel in the sink to silently catch each drop. If you're leaving town for a few days, the Texas Department of Public Safety recommends leaving cabinet doors open so that pipes on external walls are more exposed to heat. If you have pipes in an attic or crawlspace, are any other exposed pipes outdoors, they'll need insulation too. About those external faucets, disconnect hoses and insulate the valves. Wrapping valves with towels is not the best long-term solution. Most if not all North Texas hardware stores sell inexpensive exterior faucet covers made of foam that easily attach to the faucet bib in just a few seconds and do a great job protecting the pipe from freezing. If you do suspect a pipe has frozen, keep the faucet open so that water can flow when it melts. Additionally, make sure you know where your main water valve is located (and how to turn it off) in the event a pipe bursts. Even if you have a pet or animal that normally lives or sleeps outdoors, they could be susceptible to cold, hypothermia and pneumonia. The SPCA of Texas says if you'd be cold outside, odds are your pet is cold too. Bring pets inside and make sure other outdoor animals have appropriate shelter, dry and well insulated, to protect them from frigid temperatures and possible death. Horticulturalist Daniel Cunningham with Texas A&M Agrilife recommends bringing inside any perennial potted plants. Plants that cannot be brought inside will need to be covered. In the interview at the top of the page, Cunningham shows several products that can be used to help protect delicate plants. Read more on how to plant for the winter from Agrilife's Water University, here. For plants left outside, a day or two before a freeze hits, the Dallas Arborteum recommends watering the soil only by hand only, keeping the foliage dry, to insulate the plant's roots. 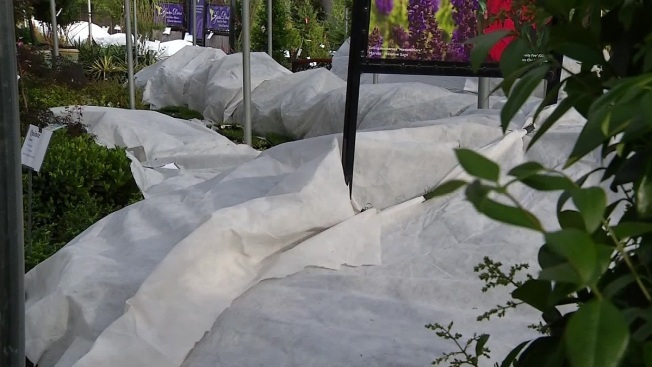 The arboretum also recommends using frost cloth (image below) to trap heat instead of plastic sheeting -- which doesn't prevent condensation. 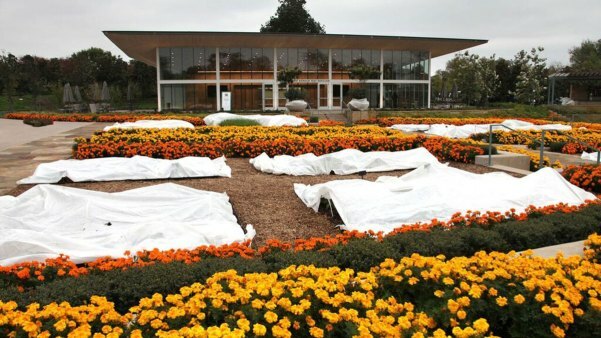 The Dallas Arboretum installs frost cloths on their vegetable garden, A Tasteful Place. You want to turn off your irrigation system for a number of reasons. One is that you don't want it running on it's normal schedule, potentially throwing water on streets where it can freeze and be dangerous for passing cars. Second, you don't want to risk any broken pipes or valves that may come with a system that has not been winterized. To winterize your system, the city of Fort Worth recommends timers and back-flow devices both be turned off, even if you have freeze or rain sensors installed, and that the main line be drained. Any pipes that are above the ground should also be insulated. Many air filters should be changed or cleaned every three months, or every season. But that's not the only winterizing needed for your HVAC system. You should have your duct work checked regularly for holes (whether from vibration or rodents) to make sure the air flow is uninterrupted. If part of your HVAC is in the attic, it may also be home to rats, mice and squirrels who find the warmth of the unit an ideal spot to build a nest. People have been visiting home improvements stores all day getting ready for Dallas-Fort Worth's first freeze of the season. Even if you have a freeze protector among your pool equipment, you'll want to look at the pump every day to make sure it's moving water through your pipes. Those pipes, too, can burst if they freeze. It's always a good idea to on hand a supply of fresh batteries in the event they're needed for flashlights during a power outage. If you didn't replace the batteries in your smoke and carbon monoxide detectors during daylight saving time -- now is a good time to make the switch. According to the National Weather Service, in North Texas the average date of the first freeze is Nov. 22 and there are an average of 33 freeze days between October and April. Most freeze days occur in December, January and February. The earliest freeze on record is Oct. 22, 1898 and the latest is April 13.